Occasionally you may want to save a copy of your web browser’s contents so that it can be kept for future reference or being forwarded to someone for sharing. While you may able to do so with default saving format in html, but if you are looking for simple ways to save them into other famous formats such as PDF, Word or etc, here is a tiny but yet useful utility that you can try. 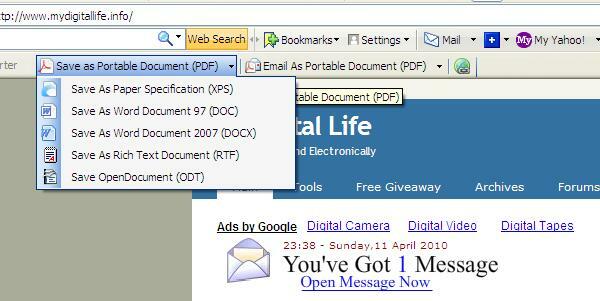 Named as DocumentExporter, it provides additional options to save any favorite web page into PDF, DOC, XPS, DOCX, RTF and ODT. Once download and install the utility, you will notice a few new options appeared in toolbar. Basically there are two actions that you can perform, either ‘save as’ or ‘email as’ with variety of format choices depending on own preference. As they are self-explanatory and when you are at the desired webpage, clicking on any of them will execute the conversion immediately. Depending on the contents and format chosen, it may take seconds for the conversion to take place and once it is done, users will be able to find the conversion file with the exact content appeared as in original webpage. Good thing is, all the inline, hyperlinks and image files are well preserved that users can simply click on those links to access online contents (with condition that you have internet service). That is not all, users can configure the page setup (like Letter, A4, A3, Legal and etc) and orientation (portrait or landscape) of the converted documents from the settings page directly. Consumed around 3MB of your hard disk space, DocumentExporter works great with Microsoft Internet Explorer and to make it more effective for web browsing, users can even access the functions by simply right clicking on context menu in IE.